In the busy summer months, don’t forget to make sure you have at least one trained employee on every job site who can give life-saving care in an emergency. Knowing what to do and being prepared in case of a medical emergency can mean the difference between life and death. If your company needs instruction in life-saving techniques, please join us on June 24th. Please see below for details. To make a reservation, please contact Mary Ellen Higgins at 502-459-9800 or mhiggins@bxkentucky.com. Date: June 24, 2014 at Builders Exchange of Kentucky, in Louisville, KY. Course Description: The Emergency Care and Safety Institute (ECSI) First Aid, CPR, AED, and Bloodborne Pathogen course is designed for all job-site workers and supervisors. During the course, an instructor conducts video-based lessons and works with students individually to complete their first aid, CPR, and AED skills practice and testing. The ECSI Course Completion Card is valid for two years. Bloodborne Pathogen training must be completed annually. Builders Exchange of Kentucky celebrated its 87th birthday in style at The Olmsted on March 27th! The annual gala was shared by more than two-hundred guests and was filled with many memorable moments. The evening’s festivities began with a hospitality hour and included a silent auction of more than forty generously donated items. Nearly five thousand dollars was raised to benefit the Builders Exchange Scholarship Program. The evening’s program included a unique perspective of Louisville’s neighborhoods offered by Councilman Tom Owen, a heartfelt tribute to John Kelly, congratulatory awards presented to two Builders Exchange retiring board members (Paul Clements and Mike Harpring), firms celebrating milestone anniversaries with Builders Exchange, and the presentation scholarships to sixteen worthy recipients. The event was unforgettable thanks to so many people. The sponsors, the silent auction donors, the presenters, The Olmsted, and the Builders Exchange staff all worked together to celebrate the evening in style! A special thanks goes to the Builders Exchange members. This celebration is for you! 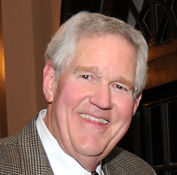 John Kelly served as the Executive Vice President of Builders Exchange of Kentucky from 1971 to 2011. He touched so many lives in his forty year career that his legacy will be felt for decades to come. Mr. Kelly departed this life on March 21st, but has left a challenge to each person who knew him, worked alongside him, and loved him. His challenge to us is to live like there’s no tomorrow, do the right thing when no one is watching, and serve others with all our hearts! John Kelly had a distinguished career, and was recognized with numerous and prestigious awards by peers and colleagues for his integrity, unselfish energy, support, and significant contribution to advancing the commercial construction industry. He served on several industry and community boards and committees, and volunteered countless hours to benefit others through his wise counsel and servant leadership. Mr. Kelly was a devoted family man, valued friend, trusted confidant, and unwavering advocate of the commercial construction industry. God bless you Mr. Kelly!